The U.S. asparagus crop value are estimated to be up from last year, while values for onions and asparagus have dropped. National Agricultural Statistics Service (NASS) office in Olympia, Washington recently reported vegetable production estimates for Northwest states as well as the whole country. 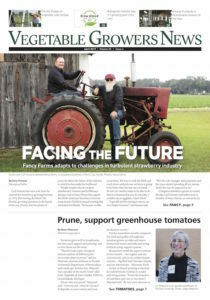 The U.S. strawberry value of utilized production is estimated to have dropped more than $100 million, from $3.49 billion in 2017 to $3.37 billion in 2018. The drop seems to be due in part to lower price ($106 per cwt. instead of $109) and slightly lower total production numbers ($31,764,900 cwt, down from 31,991,500 cwt). While growers planted a few thousand fewer acres, the yield per acre was up almost 30 cwt per acre due to higher-producing varieties. Strawberry production was up slightly in Washington, and down a bit in Oregon. The national value of onion production dropped from nearly a billion dollars ($971 million) in 2017 to $891 million in 2018, according to NASS’ report. The price per cwt dropped only 50 cents, and while growers harvested 400 more acres than in 2017, the yield is down 27 cwt per acre. Bucking the national decrease, sizeable increases were seen in Idaho and Oregon powerhouse Malheur county. Nationally, onion shrinkage and loss were down more than 300,000 cwt from last year. The total value of American asparagus production in 2018 was estimated at more than $83 million, $10 million more than last year. The price was up $2 per cwt., and also production increased 13 percent, at 756,500 cwt up from 671,200 cwt in 2017. The production increases came as growers planted and harvested thousands of fewer acres. The national acreage of asparagus harvested, at 20,700 acres, is down 11 percent from last year. Fresh production, at 603,800 cwt, is up 16 percent from 2017. Processed production, at 7,264 tons, is down 3 percent from last year. Michigan’s asparagus production totaled 238,000 hundredweight (cwt) in 2018, down 2 percent from the previous year, according to NASS’ Michigan Field Office. The area harvested for fresh market and processing was 8,500 acres, down 500 acres from 2017. Yield, at 28 cwt per acre, was up 1 cwt per acre from the previous year. Total value of Michigan’s asparagus production was $20.8 million, up slightly from 2017. Although statistics for other states were not broken out, Washington’s value of production was up roughly $5 million from last year.